Announcing the End of A Glorious Competition! Yes, the AITA Men’s singles and doubles championship has called it a ‘pack up’ today. It has indeed been a wonderful tournament that has been graced with some of the most talented players from all over India. The success of the tournament means a lot to the Ravine Hotel owners and staff and everyone is truly proud to have put through a great show for both, the players as well as the spectators. Why This Tournament Was So Special? This AITA tennis tournament was indeed special. For one thing, the Ravine Hotel tournament entry roster had broken all records with a phenomenal turnout of over a hundred players having enrolled for the qualifiers. As the qualifiers heat died down, you’d have thought that it would have calmed down a bit. Oh, but everyone was so wrong, for as the top few made it through the main rounds, the excitement was palpable. There were enthusiastic spectators encouraging their stars and the frenzy really got to everyone. One could actually see the competitions heating up in the crowds as well. Oh and did I forget to mention the other special thing about this year’s championship? We had one more tennis court this year. Working round the clock to get the new addition ready in time for the tournaments really did pay off, as players were able to play and practice to their heart’s content. Players were even seen working up a sweat late evenings and early mornings, getting a good feel of how the Panchgani tennis courts play under lights. Oh and one more thing, Salman Khan, Arbaaz Khan and some other big and small stars were gracing the Ravine Hotel at this time of the year. Many tennis players and families even got glimpses of them as they shuttled in to and fro from their shoots. Players took it as inspiration and spectators thanked their lucky stars, but for us, it definitely meant that this year’s tournament time was truly special. 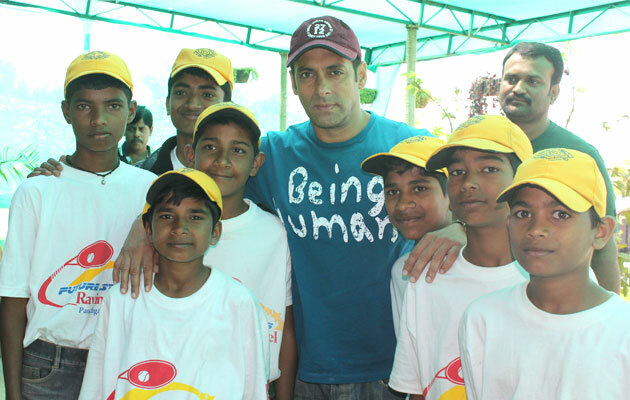 In fact, Salman Khan was even gracious enough to give our young little ball boys a photo shoot to remember. If you missed the occasions, you sure may want to mark down all the future Ravine Hotel tournaments on your calendar for the next times. While everyone who participated in all the fun and excitement is a star in our eyes, we must definitely acknowledge the winners who have progressed through multiple rounds and beaten all odds to lift the trophies. Doubles Winner: Sameer P and Mankad B. This year, the frenzy of these championships really caught us all. We even had a couple of our own participants in this tournament. From the ball boys and the referees, to the participants and their families and friends, from the hotel staff to the masseurs at the Serenity Spa, everyone was in on the excitement. And to top it, everyone will be going home with a smile tonight, irrespective of whether they have won or lost and irrespective of whether they have encountered a star or not, simply because they have all enjoyed the Ravine hospitality and simply because this will definitely be one of the best times they have ever had.